Rush were inducted into the Guitar Center’s RockWalk on Tuesday. The invite-only event was held at the retailer's historic Hollywood location on Sunset Boulevard. The Rush ceremony featured an induction speech by rock DJ Jim Ladd. "We are very pleased to have been chosen by our peers and fellow musicians for induction in Guitar Center's RockWalk," said Geddy Lee. "It is an honor to have our names added to this illustrious list of great and highly talented musicians." "Not only is Rush extraordinary as a band, but each member is incredibly talented in their own right," said Dave Weiderman, Chairman of Guitar Center's RockWalk. "With nearly thirty years together, this group has consistently delivered skilled musicianship, experimental-drive and stylistically diverse rock to music fans worldwide. In short — Rush is long deserving of being honored by Guitar Center's RockWalk." Guitar Center's RockWalk is dedicated to honoring those artists who have made a significant impact and lasting contribution to the growth and evolution of Rock 'n' Roll, Blues and R&B. As new inductees, Rush’s handprints will reside in the RockWalk alongside other accomplished musicians and innovators such as Eric Clapton, George Martin, Jimmy Page, Iron Maiden, Carlos Santana, Johnny Cash, Van Halen, AC/DC, Aerosmith, Marvin Gaye, James Brown, B.B. King, Stevie Wonder, Run-D.M.C. and Queen, among numerous others. 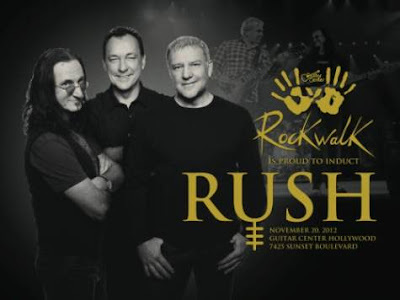 Rush are on the road for the Clockwork Angels tour; the current North American leg wraps up December 2 in Houston, Texas.